H, an imaginative artist and culinary fanatic, secures a rare invitation to eat at Bistro A in midtown Manhattan. He endures one difficult test after another in an effort to win the chef’s admiration and prove he’s worthy of sampling the restaurant’s famed fricassée. Bistro A looks closely at how chefs, restaurant staff and restaurant patrons operate and interact, and how cooking, serving others and eating are some of the great joys in life. Given the expression, “Three hours to prepare, five minutes to eat,” the novel aims to show that the greater joy is found in the former, rather than the latter. While Bistro A is serious food writing, it’s also poetic, humorous, fanciful, even wacky at times. 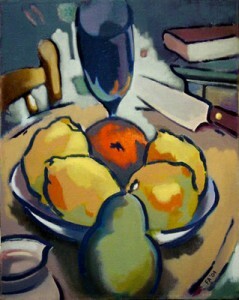 Bistro A is offered as an eBook in a Deluxe Edition with twelve original, full-color paintings by the author. Read a sample with just one click. Purchase Bistro A – Deluxe Edition at a special promotional price: $0.99. Posted in Uncategorized	| Comments Off on Now available from Amazon!